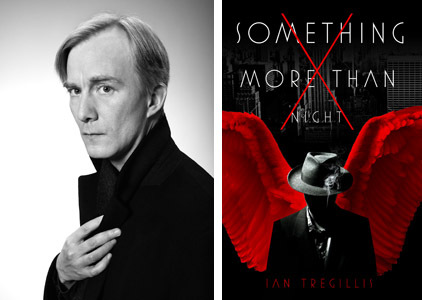 BOOK GIVEAWAY: US & Canadian residents can enter a random drawing to win a free copy of Ian’s new book ‘Something More Than Night’ simply by Liking this post (at the bottom) and Retweeting the tweet that alerted you to this giveaway. Ian Tregillis is the son of a bearded mountebank and a discredited tarot card reader. By day he works as a physicist at Los Alamos National Laboratory and by night he pens moderately entertaining lies. He is the author of the Milkweed Triptych (‘Bitter Seeds’, ‘The Coldest War’, and ‘Necessary Evil’) as well as the new standalone novel ‘Something More Than Night’. His short fiction has appeared in Tor.com, Apex Magazine, and Subterranean Press. A member of George R. R. Martin’s Wild Cards writing collective, he has contributed to several volumes of that long running shared-world anthology series. So far, my books have mostly been aimed at late-teen to adult readers. Although I think younger readers could definitely read my books as well — I just try to be careful when parents ask me whether their kids might enjoy my books. The Milkweed series in particular is a little bit dark, and while many younger readers read dark stuff all the time — dystopian YA is huge right now, isn’t it? — parents sometimes balk at things their kids won’t. Having said all that, I don’t intentionally target one age group or try to avoid another when I sit down to write. I just write the stories that are interesting to me, and hope an audience will follow. Although I have a background in the hard sciences, I haven’t written any hard science fiction. I tend to gravitate toward fantasy, usually rooted in the real world. The Milkweed books were a fantasy alt-history of World War II and the Cold War featuring superheroes and blood magic. I’m also currently writing a fantasy clockpunk trilogy that has an element of alternate history to it. Henry: Fantasy clockpunk!? You’re a big tease, that’s what you are. ‘Something More Than Night’ is basically a 1930s noir murder mystery set in a medieval vision of Heaven. I like to say it’s what you might get if you swapped out central casting for a Raymond Chandler novel with Thomas Aquinas’s vision of the heavenly choir: Angels, Archangels, Cherubim, Seraphim, Virtues, Thrones, Powers, Dominions, Principalities… I’m fascinated with the weird beings that crop up in medieval Christian theology, artwork, and in the apocrypha– with four faces and six wings, angels with faces of flame, wheels covered in eyes, and so forth. So I wanted to play with those images. At the same time, I’m a big fan of Raymond Chandler’s Philip Marlowe books. And I believe in writing against obstacles, that is, of setting goals in order to stretch my skills and force me to push myself a little bit. So I decided early on that it would be fun if one of the characters spoke like a 1930s detective. That meant I had to devote a fair amount of time to reading from the genre and assembling a slang glossary for myself. That document eventually grew to 80 pages. Henry: Four faces? Six wings? Angels with faces of flame? Wheels covered in eyes? Those medieval Christians knew how to party! I wrote the book entirely for fun, for my own enjoyment, as a treat to myself after finishing the Milkweed series. So primarily I hope that sense of fun comes across to the reader. While the book is partially written in a noir mode, it’s also a science fiction novel, and I took the opportunity to sprinkle some interesting physics into the book. I hope readers enjoy those aspects of the book as well. But really, it’s the same with every book I’ve written: I hope it finds an audience of people who are entertained by it. That’s my highest aspiration for this book. Henry: It’s almost as if you wrote the book to cleanse your literary palate. I often find that there comes a point in any project (whether it’s a short story or novel) when the initial enthusiasm and excitement have run out, but I’m not yet close enough to the end to get that thrill of knowing I’m close to the end. It’s often around the middle third or third quarter of the project. I find sticking with the work most challenging when it starts to feel like a slog. Without question, it would be the day I walked into a bookstore, found my debut novel on the New Releases table, and bought a copy. That had been a lifelong dream for me since long before I became a writer. It was pretty fun, I must admit. Henry: I have to ask. Did you autograph your own copy of your book? Everybody writes differently, and everybody’s process is unique. The key is to find what works for you. And to recognize that different projects sometimes require different processes, or that your process can change over time. But the key thing — the thing that’s the same for every writer in the world — is that in order to be a writer you have to sit down and actually do the work. You can’t be a writer unless you write. Even (especially) on those days when it isn’t feeling very exciting or fun. Henry: I’m flashing on Malcolm Gladwell’s rule that the key to success in any field is, to a large extent, a matter of practicing a specific task for a total of around 10,000 hours. Nothing strange. But one ritual I try to observe every time I begin a writing session is to disable the wireless or unplug the internet connection before I begin. The internet can be a huge boon to a writer, but it is also a source of perpetual distraction. Henry: That is sage advice. Henry: Plus teleportation lowers your carbon footprint. Well played, sir. I’d say Roger Zelazny, Raymond Chandler, and Elizabeth Bear. All three because I’m a huge admirer or their work. The former two because I never had a chance to meet them, and I stand in awe of their craft. And Bear not only because of that awe factor, but also because she’s been very kind to me as an aspiring writer and I feel I owe her a dinner for that. Henry: I met Zelazny at a conference, and I thought his Amber series was groundbreaking at the time. I love to travel, hike, read, and spend time with my fiancée. Henry: As do I. Except not the your fiancée part. My website is IanTregillis.com. I try to keep it updated with my publications, news about future books, release dates, etc. I’m also on Twitter @ITregillis. Categories: Books, Fantasy, Science Fiction | Tags: author, George R.R. Martin, interview, YA | Permalink.